We have had spring rains this week (off and on) but its the promise of what these rains bring that is exciting. May should be delightful! 1. Sarah managed wee ponytails for Klaire yesterday. We were watching the girls, and I took Kamryn with me to the dairy and we came home to this cuteness. 2. I've wanted a Quince shrub for a few years. I found a red one at a local place. Its called Double Take Scarlet by Proven Winners. 3. Through Brenda I found @elizabethgoudgebookclub on Instagram! 4. I bought a fun and lemony tablecloth for the deck table. So far it has blown off five times, and gotten rained on for days. Its cute though. 5. We used to have a big four slice toaster, which was great when we had eight family members living here. Then, over time one slot, then two, didn't work and the two remaining ones had issues. I finally threw it out and bought this beauty. Only two slices, but that is not an issue here any more, with only five of us in the house! Another way I bring fresh flowers into my cottage is by growing them in my garden. I've slowly built up my hydrangea varieties, and I have several kinds of peonies. I have a few roses, but I'd love to get some David Austin roses! I also grow Purple Cone Flower (Echinacea), Feverfew, Daylilies, Zinnias, Iris, Larkspur, Hollyhock. Bleeding Heart. I cut them and make small bouquets in the cottage. There is nothing better for washing dishes than some sweet flowers on the back of the sink. Grocery stores often have very nice flowers available. I bought them at Aldi for $3.99 a bunch. I used them for the shower that I helped with on Saturday. I love fresh flowers in my cottage. What about you? Do you like fresh flowers? Right next to our kitchen door is a lilac bush. I've had a love/hate relationship with it for years. After years of not producing flowers I had Tim cut it down, and he was going to take it out but didn't get to it. It started to grow again and at least it looked nice in the space, so I left it. Then it began to bloom every year! With our long winter, we're about three weeks behind where we normally are with trees and flowering shrubs. I'm thankful for that spring is here and even though we are having April 'showers' today, the promise of the flowers in May is worth it! I'm looking forward to the scent of lilacs filling the air, and that scent drifting into the house. I had a busy weekend. Friday afternoon, Lindsay and I made scones (both gluten free and our regular sweet scone) and lemon curd and mock devonshire cream for our friends' bridal shower on Saturday. On Saturday, I arrived at the shower several hours early and helped to set the tables and to set up the food table. I have no close up photos of that but you can sort of see it in one of my photos. The last two photos were taken with my 'selfie' stick, and I did them in a hurry. Sorry for the poor quality! I used white table cloths, and several of my green plants from home, a few white birds, pink and red roses, books, tiered plate holders. I used other items to be able to have the food on the table at varying heights. It looked really nice. When I came home, I changed clothes and sat out on the deck, in the beautiful sunshine! Spring has finally decided its here to stay, no more dodging back into winter. We are about three weeks behind with our plants and flowers. 1. We are big readers and know the pleasure of well written books. 2. It is my belief, that if you can read well, you can teach yourself anything. This desire to pass along a love of reading is extended to my grandchildren. We encourage a love of reading/books by reading to them, and buying them their own books. I have books here at the Cottage, that are just for them, even the toddlers. Klaire loves to get these books out everytime she's here. She also gets into my books, but it is a training process - "Not those books, these are YOUR books!" I got a few cute photos of her yesterday. Have you seen these Baby Lit books? They are really cute, I bought Klaire and Isla, Pride and Prejudice and Little Women. Lindsay found cute sets of them for the girls at Christmas. 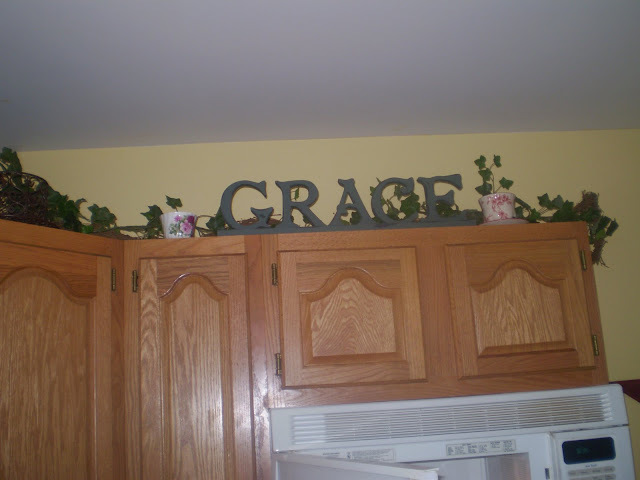 When we bought our house we had to replace the kitchen cabinets as the ones in the house were water damaged. (Tim repurposed the upper cabinets in his shop) We put in cabinets that we could afford, and though I wanted white, the honey oak were better quality so we went with them. I painted them almost two years ago with chalk paint and waxed them. They were so nice, until they wouldn't clean well, and started to chip. I'm certain that the fault is mine, as I know that many have had great success with chalk paint. I love using it on furniture, myself. Anyway, the cabinets were looking dingy, and chipped. I knew it was time to repaint. Tim and I have come to learn that you get what you pay for with paint, so I checked out Sherwin Williams. The paint they recommended for this job was $90 a gallon! I decided to give Magnolia Homes Paint by Kilz at try. I bought it at my local Ace Hardware store in the formulation for trim and cabinetry. I chose the color True White. I came of age in the Reagan Era. I found Nancy Reagan hard to relate to, but I really liked Barbara Bush. She was the kind of woman that made you feel like you could be friends with her. It would have been fun to be her friend, I think, as she was loving, kind, humorous, self depricating. I've read both of her memoirs (really easy reading and so fascinating), and one story has always stayed with me. Barbara used to drive across country from Texas to Connecticut, with her children, to visit her parents. On one of her trips, their housekeeper, who was African American, was traveling with them. Barbara stopped for the night at a hotel, but the hotel wouldn't allow the housekeeper to stay with them in the hotel, so Barbara wouldn't stay either. They all slept in the car instead! I loved her love and commitment to George, her family. I like that she was always grateful to have had the opportunity to serve the country, and to continue to work to help people with literacy. I follow Ruth Chou Simons on Instagram. She's a beautiful artist, wife, mother of six boys. She shares her art and life and truth of God's goodness through her Instagram account and in her art. Her website is Gracelaced. I pre-ordered her latest book and I've been enjoying it since it released. "Something will shape us and form us into who we become--it can either be the truth of God's Word or our own feelings. Let it be His truth that transforms us." I needed to hear this today, and probably need that reminder on a weekly basis. Friday and Saturday were lovely days. Warm and sunny, we had the doors and windows open. By Saturday night a cold front moved through and Sunday was rainy, windy and cold. A forty degree drop in temperature from Saturday to Sunday. Crazy spring 2018. My weekend actually took a turn mid-morning when my friend needed a ride to the ER. She's fine, and we were grateful for that news. Our daughter in law, Kayleigh, is going to cosmotology school to be a nail tech. The school had a free mani/pedi night so the students could practice. We ladies all went, including Lindsay and my mom. Lindsay, my mom, and I all got manicures. We got the full treatment, including hand soak, and hand massage. Mom chose a pretty mauve color. Lindsay went for bold and fun. She does acrylics on her nails. I always thought that acrylics were always plain and you had polish applied, but hers are done with colored acrylics and have no polish on them at all. Rachel and Sarah got the full pedicure treatment. You can tell they enjoyed themselves fully. We had a good time, and it was especially fun to do it together, and support Kay and the other women in their training.